Growing your own fruits, veggies, and flowers from seeds is way less intimidating. If you are like many gardeners, you have never tried growing your own plants from seed. Or, if you have tried, maybe your seedlings didn’t resemble those you see at the garden centre each spring, and you’re wondering how you can do better. Rest assured, starting your own seedlings is fun, easy, and well worthwhile. By growing your own transplants, you can choose from hundreds of unusual varieties—including those with tolerance to heat or cold, disease resistance, and unmatched flavour—that simply aren’t available at garden centres. Plus, you’ll have the satisfaction of knowing that you’ve grown your entire garden organically right from the very start. For healthy seedlings, you’ve got to give them a loose, well-drained medium (seed-starting mix) composed of very fine particles. You can buy a seed-starting mix at your local garden centre. Don’t use potting soil—often, it’s too rich and doesn’t drain well enough for seedlings. Living Green Donegal compost is excellent for all of this. I have it here in Dalkey Garden School for sale. Many gardeners start their seeds in leftover plastic “six packs” from the garden centre, empty milk cartons, or Styrofoam cups. If you don’t have containers on hand, you can buy plastic “cell packs,” individual plastic pots, or sphagnum peat pots. Or make your own pots from newspaper or egg cartons. Whatever you use, be sure your containers drain well (usually through holes in the bottoms of the containers). Set the pots inside a tray so that you can water your seedlings from the bottom (by adding water to the tray) rather than disturbing them by watering from the top. You can buy seed-starting trays at garden centres. Moisten your seed-starting mix before you plant your seeds. If you water after you plant the seeds, they can easily float to the edges of the container—not where you want them to be. To moisten the mix, simply pour some into a bucket, add warm water, and stir. After about 8 hours (or when the mix has absorbed the water), fill your containers with the moistened mix. Cold compost can be a bit of a shock and slow germination (waking seed). Plant at least two, but no more than three, seeds per container (this is to allow for the presence of a sterile seed). After you’ve planted your seeds, cover the tray loosely with plastic to create a humid environment. At 20° to 25°C, your seeds should sprout just fine without any supplementary heat. If the room temperature is cooler than that, you can keep the seeds warm by setting the tray on top of a heating mat made specifically for starting seeds, a Propagator or on a warm window sill. Cover seed trays creating a micro environment. Wipe off excess moisture, and check your trays daily. As soon as you see your seeds sprouting, remove the plastic covers and immediately pop the trays beneath lights. You can invest in grow lights (which provide both “warm” and “cool” light), but many gardeners have good results with standard 1m. fluorescent shop lights. Set your seedlings as close to the light as possible—100mm away is about right. When seedlings don’t get enough light, they grow long, weak stems. As the seedlings grow, raise the lights to maintain the proper distance. And don’t worry about turning off the lights at night. Contrary to popular belief, seedlings don’t require a period of darkness. Fluorescent lights are only one-tenth as bright as sunlight, so your seedlings will actually grow better if you leave them on continuously, and not a s leggy. If this happens pinch out the growing tip and this will also help to bush out the seedling helping it become a stronger plant, with a tighter root structure. If you’re growing medium contains only vermiculite and peat (as many seed-starting mixes do), you’ll also need to feed your seedlings, using Living Green really helps here because of the worm casts in the peat. When the seedlings get their first “true” leaves (not the tiny ones that first appear, but the two that follow), mix up a very weak fish emulsion solution (details later) or a weak multipurpose liquid feed add it to the seedlings’ water every other week. As the plants grow bigger, gradually increase the strength of the mixture or else “pot on” once the roots are filling the container, either or into the ground. Tomato, courgette, and pumpkin seeds should push their sprouts through the surface of the mix in a few days. Peppers sprout in about a week. And some seeds, such as parsley, can take as long as 3 weeks to sprout—so be patient! Parsley could be pre-soaked to help speed up the process. NB Remember to Label!!! Name of seed / date. Make sure you use a permanent marker. It is scary how quickly we forget what we plant and also date as some seedlings can take some time to germinate and we can then be nicely surprised! You have now completed Step No 1 – well done! 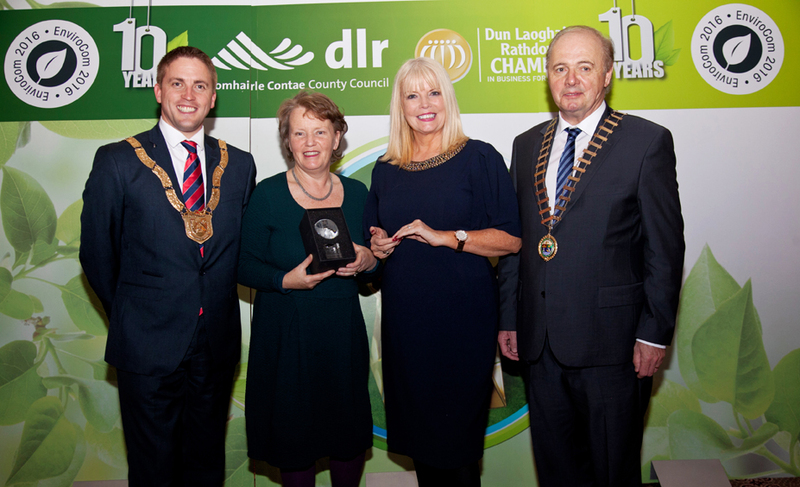 Micro-Enterprise awarded to Dalkey Garden School by Cllr Cormac Devlin, Minister of Jobs, Enterprise and Innovation Mary Mitchell O’Connor, President of the Dun Laoghaire Rathdown Chamber President Pat Neill. Annmarie through her teaching of sound horticultural practices, encouraging her students to ” Leave behind hand prints, not foot prints.” Positive action will help to heal the environment. Small groups, small steps lead to great things. It is this philosophy which drives Dalkey Garden School forward. When in contact with flower bulbs wear gloves as they can irritate skin. When growing bulbs in a pot, pick a container that is the right size and will complement your chosen bulbs. Anything that has drainage holes and is deep enough to accommodate a few inches of soil and the bulbs works as a container. You’ll need to allow a 1-inch space between the tip of the bulb and the rim of the pot, where you can top dress with 6mm.gravel/pebble. If you are using a clay pot with a large drainage hole in the base, cover it with a piece of broken pot. This prevents the soil blocking the drainage hole. Add layer of gravel to help with drainage and then 75 mm of potting mix/compost to the container, and firm it gently. Place a bulb on the soil, and twist it a quarter-turn to give it some grip in the soil. Add the rest of the bulbs, spacing them no more than 10 mm apart, don’t let the bulbs touch. Add more potting mix around the bulbs, firming it into place with your fingers. 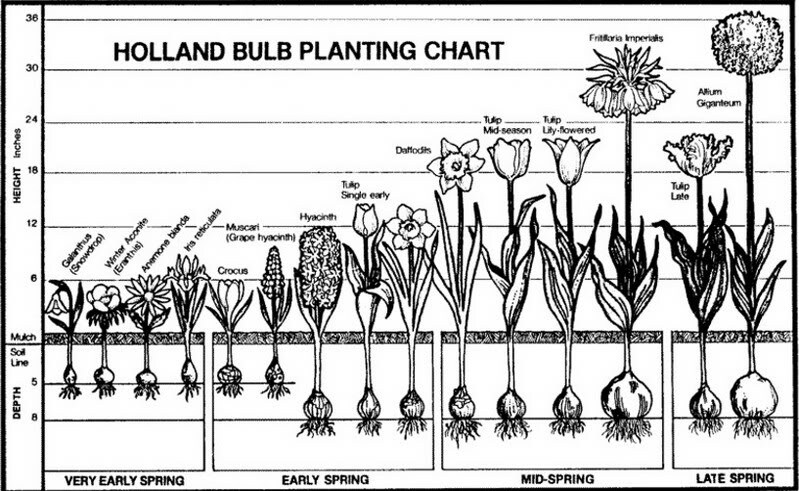 The tips of the bulbs should barely show through the soil surface. Water well until some moisture leaks from the drainage holes. If channels or holes develop in the potting mix, fill them with moistened potting mix. Bulbs in pots need more care than those in soil. Keep the compost moist and protect from frost by wrapping with bubble wrap over winter. Cover with a piece of chicken wire to prevent squirrels, mice and voles from digging them out. Remove it when shoots appear. Check pots regularly. During the chilling phase, the bulbs are growing roots so it’s important that the potting mix not dry out. Check regularly for moisture by sticking your finger into the potting mix. If it feels dry an inch deep, fill the pot to the rim with water, and allow it to drain. Be careful not to overwater. Excess moisture can lead to rot. Check that the pots are draining. Watch for emerging top growth. After six to eight weeks of chilling, green shoots should begin to emerge. At this point you could add a slow release fertiliser to help bulk up the bulb for next year. If you live in a mild climate, this should coincide with the emergence of bulbs in outdoor beds. If you live in a cold-winter region, keep the containers in their cool place until you wish to encourage growth. Keep an eye out for slugs; remove them to compost bin and let them work there! We do need them. Place containers where they will receive light. Temperatures over 20 C push bulbs to grow too quickly, resulting in floppy, leggy top growth. A location in light shade should provide the right balance of light and moderate temperatures. To ensure that your bulbs stand erect, you can support top growth with flower rings or stakes and twine. If you want to save these bulbs, water regularly after the blossoms fade. The leaves will eventually start to turn yellow and dry up. When the leaves have completely turned dry and brown, empty the pot onto your compost pile. Retrieve the bulbs and allow the soil that clings to them to dry. Remove dead foliage, brush off dry soil, and store the bulbs in a cool, dry place. In the autumn, plant these bulbs – except tulips, which don’t re-bloom very well — plant into a garden bed and purchase new bulbs to pot up in containers. European topiary dates from Roman times. Pliny’s Natural History and the epigram writer Martial both credit Cnaeus Matius Calvinus, in the circle of Julius Caesar, with introducing the first topiary to Roman gardens. Pliny the Younger describes in a letter the elaborate figures of animals, inscriptions, cyphers and obelisks in clipped greens at his Tuscan villa. Within the atrium of a Roman house or villa, a place that had formerly been quite plain, the art of the topiarius produced a miniature landscape (topos- a Greek word) which might employ the art of stunting trees. Cloud-pruning The clipping and shaping of shrubs and trees in China and Japan have been practised with equal rigour, but for different reasons. The goal is to achieve an artful expression of the “natural” form of venerably aged pines, given character by the forces of wind and weather. Their most concentrated expressions are in the related arts of Chinese Penjing and Japanese Bonsai. Japanese cloud-pruning is closest to the European art. The cloud-like forms of clipped growth are designed to be best appreciated after a fall of snow. Since its European revival in the 16th century, topiary has been seen on the parterres and terraces of gardens of the European elite as well as in simple cottage gardens. Traditional topiary forms use foliage pruned and/or trained into geometric shapes such as balls or cubes, obelisks, pyramids, cones, or tapering spirals. Representational forms depicting people, animals, and man-made objects have also been popular.Topiary at Versailles and its imitators was never complicated: low hedges punctuated by potted trees trimmed as balls on standards, interrupted by obelisks at corners, provided the vertical features of flat-patterned parterre gardens. Sculptural forms were provided by stone and lead sculptures. In Holland, however, the fashion was established for more complicated topiary designs; this Franco-Dutch garden style spread to England after 1660. 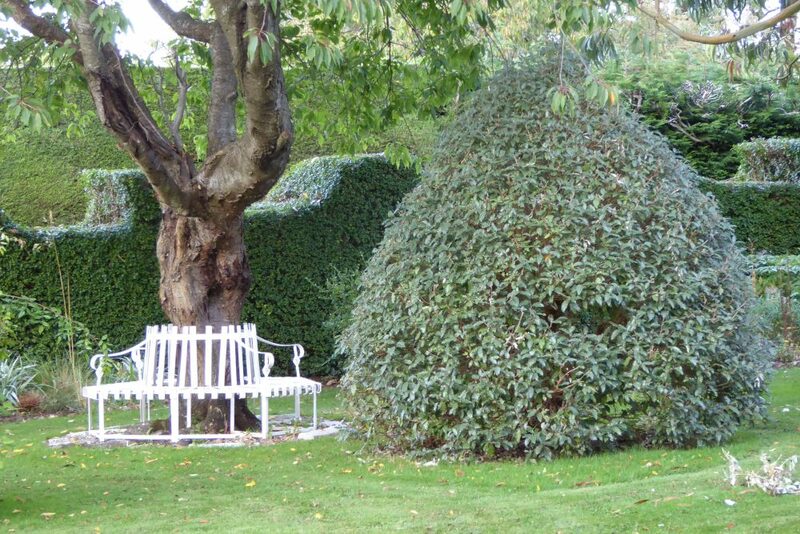 In England, topiary was all but killed as a fashion by the famous satiric essay on “Verdant Sculpture” that Alexander Pope published in the short-lived newspaper The Guardian, 29 September 1713, with its mock catalogue descriptions of Adam and Eve in yew. In the 1720s and 1730s, the generation of Charles Bridgeman and William Kent swept the English garden clean of its hedges, mazes, and topiary. Although topiary fell from grace in aristocratic gardens, it continued to be featured in cottagers’ gardens, where a single example of traditional forms, a ball, a tree trimmed to a cone in several cleanly separated tiers, meticulously clipped and perhaps topped with a topiary peacock, might be passed on as an heirloom. Beckley Park, Oxfordshire: cottage garden topiary formulas taken up in an early 20th-century elite English garden in a historic house setting. The revival of topiary in English gardening parallels the revived “Jacobethan” taste in architecture; John Loudon in the 1840s was the first garden writer to express a sense of loss due to the topiary that had been removed from English gardens. The art of topiary, with enclosed garden “rooms,” burst upon the English gardening public with the mature examples at Elvaston Castle, Derbyshire, which opened to public viewing in the 1850s and created a sensation. “Within a few years architectural topiary was springing up all over the country (it took another 25 years before sculptural topiary began to become popular as well).” The following generation, represented by James Shirley Hibberd, rediscovered the charm of topiary specimens as part of the mystique of the “English cottage garden,” which was as much invented as revived from the 1870s. It may be true, as I believe it is, that the natural form of a tree is the most beautiful possible for that tree, but it may happen that we do not want the most beautiful form, but one of our own designing, and expressive of our ingenuity. The classic statement of the British Arts and Crafts revival of topiary among roses and mixed herbaceous borders, characterised generally as “the old-fashioned garden” or the “Dutch garden” was to be found in Topiary: Garden Craftsmanship in Yew-Taxus baccara and Box – Buxus sempervierens by Nathaniel Lloyd (1867–1933), who had retired in middle age and taken up architectural design with the encouragement of Sir Edwin Lutyens. Lloyd’s own timber-framed manor house, Great Dixter, Sussex, remains an epitome of this stylised mix of topiary with “cottagey” plantings that was practised by Gertrude Jekyll and Edwin Lutyens in a fruitful partnership. The new gardening vocabulary incorporating topiary required little expensive restructuring. Americans in England were sensitive to the renewed charms of topiary. When William Waldorf Astor bought Hever Castle, Kent, around 1906, the moat surrounding the house precluded the addition of wings for servants, guests and the servants of guests that the Astor manner required. He accordingly built an authentically styled Tudor village to accommodate the overflow, with an “Old English Garden” including buttressed hedges and free-standing topiary. In the preceding decade, expatriate Americans led by Edwin Austin Abbey created an Anglo-American society at Broadway, Worcestershire, where topiary was one of the elements of a “Cotswold” house-and-garden style soon naturalised among upper-class Americans at home. Topiary, which had featured in very few 18th-century American gardens, came into favour with the Colonial Revival gardens and the grand manner of the American Renaissance, 1880–1920. In Northern Ireland, Edith Vane-Tempest-Stewart, Marchioness of Londonderry at Mount Stewart(1878 – 1959) was busy recreating ancient Irish Mythical legends using Topiary. Interest in the revival and maintenance of historic gardens in the 20th century led to the replanting of the topiary maze at the Governor’s Palace, Colonial Williamsburg, in the 1930s. 20th Century American portable style topiary was introduced to Disneyland around 1962. Walt Disney helped bring this new medium into being — wishing to recreate his cartoon characters throughout his theme park in the form of landscape shrubbery. This style of topiary is based on a suitably shaped steel wire frame through which the plants eventually extend as they grow. The frame, which remains as a permanent trimming guide, may be either stuffed with sphagnum moss and then planted, or placed around shrubbery. The sculpture slowly transforms into a permanent topiary as the plants fill in the frame. This style has led to imaginative displays and festivals throughout the Disney resorts and parks, and mosaic culture (multiple types and styles of plants creating a mosaic, living sculpture) worldwide includes the impressive display at the 2008 Summer Olympics in China. Living corporate logos along roadsides, green roof softscapes and living walls that biofilter air are offshoots of this technology. 21 Century For me was seeing the very simple sculpting of the hedges of the Jardin Plume in Normandy, creating shape ,silhouette, an inspirational backdrop has led me to try and do the same with my own very old Privet hedge. If you are fortunate to have a mature garden with over grown shrubs, have a very good look at them as you can create, often interesting shapes, raising the canopy, allowing for more interesting planting, very simply adding to your garden without much effort or cost. The best time to trim Box -Buxus sempervirens is on a dull day, sunny days can scorch plants and a wet day Box blight could become a problem. Feed after with a slow a general nitrogen rich fertiliser — compost, seaweed or manure. What’s the difference between a snowdrop and a snowflake? Snowdrops, have two distinct whorls of corolla segments (“petals”), arranged so that the three outer segments are large and usually unmarked, while the three inner segments are smaller and form a tube in the centre of the flower. They usually bear green markings at their tips and sometimes at the base as well. Snowflakes, members of the genus Leucojum, have six corolla segments(petals) of equal length, each tipped with green or yellowish-green. Their leaves are also usually glossy bright green, and the plants look much bigger than a snowdrop. The spring snowflake is Leucojum vernum, and the summer snowflake, or London lily, is L. aestivum. Known as Black Gold, the essential ingredient to help sustain a healthy environment in your Garden. It is important to return to the soil, as much as possible, what you have removed. The soil is composed of millions of insects, micro organisms and fungi, all with their own jobs. Breaking down, organic matter, recycling nutrients, creating channels for both air and water. Bulky organic matter, in the form of compost and manure forms structure which acts like a sponge retaining large amounts of water, helping especially in drought situations. Soil heat is retained longer as it acts like an insulating blanket. 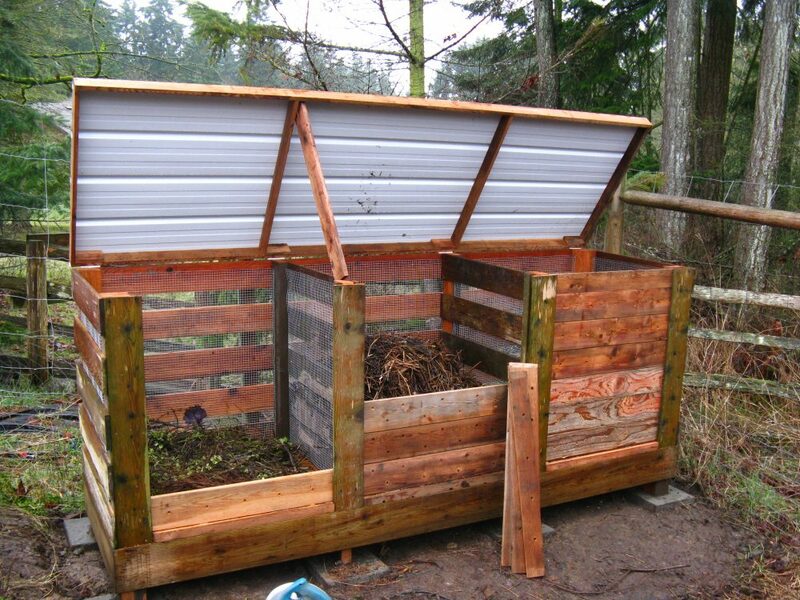 Home compost is made from all organic non-cooked waste. Never add meat or any cooked food as it will attractive wild life to your heap (rats). It is a combination of 2/3 green (vegetative) and 1/3 brown (twigs, shredded paper — carbon, saw dust, wood chip). In an ideal situation do not add weeds, especially with seeds. These can be composted separately in double black plastic sealed bags and left for approx. 2 years to insure all traces of original make up has ceased. Personally, I feel we will always have weeds and add everything except certain weeds which are particularly difficult to deal with e.g., Convolvulus roots (bind weed). A really well working compost heap will create heat, thus killing weed seeds sometimes actually going on fire!! Diarmuid Gavin taking my photo up at Mount Stewart yesterday (well there were a few others there also!) Great information shared from Richard Wheeler,Kenneth Cox, and of course, Diarmuid. Mount Stewart looking amazing and the house is absolutely beautiful. I feel so lucky to have such a passion for gardening as it brings me into contact with such special places and fantastic people.